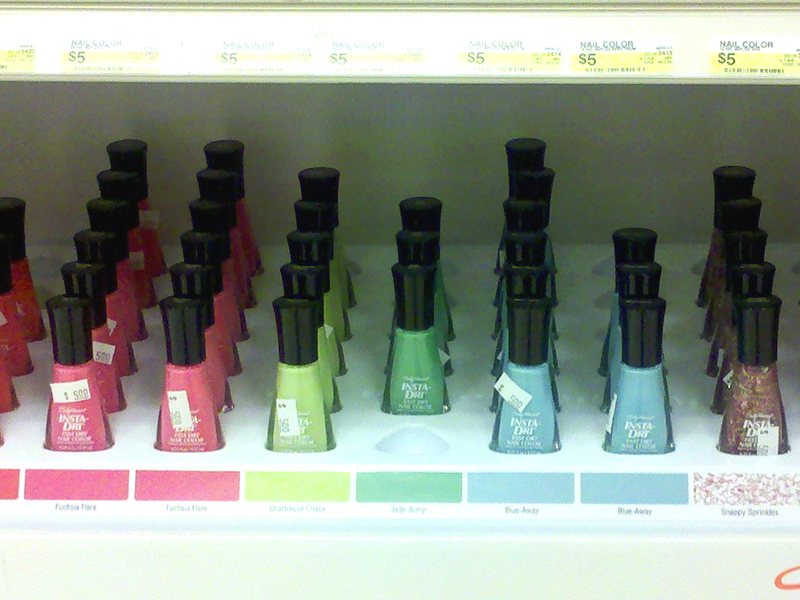 Here are a couple of what I believe are new Sally Hansen displays that I spotted at Target today. I didn't pick any up, but I did think the mint green (Jade Jump)and baby blue (Blue-Away) in the Insta-Dri line were pretty, and the crazy glitter on the far right (Snappy Sprinkles) is interesting, to say the least! I think most of these shades are new, but I'm starting to get confused because a couple of the polish names looked familiar. Have you seen these yet? I have the Xtreme wear in Mint Sorbet & its amazing!! It's such a great product for such a small price!! I also love the Insta dri's they have a great breash that makes it so easy to apply! I have the Insta-Dry in the blue color and it's very pretty! I did see a small display at cvs and purchase Jade jump and blue away! love em. They totally recycled some of these names...Jade Jump = Jumpin' Jade and Blue Away = Blue Me Away. I just saw these today. Some of the shades are definitely new (perhaps with recycled names) but they're mixed in with old favorites like Snappy Sorbet. 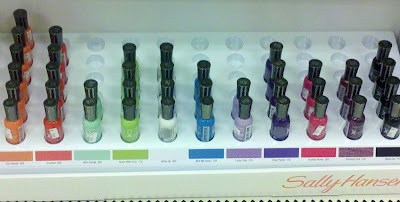 I was definitely intrigued by the nice baby blue, but it reminded me a lot of OPI What's With the Cattitude? Oh well. The Xtreme wear display looks like mostly core colors mixed with a few spring LEs. Interesting to see what's selling out. Blue Me Away is one of the first polish I bought... when I was in the USA almost two years ago ! It's still pretty though. These look so pretty. Nice shades for spring. Right on the ball! =D The Chartreuse Chase is Insta-LOVE! ;-) I picked it up today. I'd like to try the lavendar/pinky one too. Can't think of the name. There was a display at Ulta in my town of these new Insta-Dri shades alone, not with oldies. The Xtremes all seemed like ones I've already seen around though.